The Kayano 23 continues to live up to the lofty standards set by its predecessors. An influx of some technologies makes it lighter and more durable while it remains to be very well-cushioned and stable. Despite being always on the more expensive side of things, the Kayano is an established name where cushioning and stability are needed by runners. This shoe is one of only a few running shoes that actually has a long history. Designed by Toshikazu Kayano of Asics, this is the 23rd edition and likely the worst. The reflectivity has been downgraded since the version 21. The rear of the shoe has a large area of reflective material that is about half as bright as the older Kayano. There's no obvious reflective material on the front of these shoes and reflective material should be obvious. I say bring your own reflective shoelaces! The Kayano has always been a durable shoe. The heel area has one section of AHAR (Asics High Abrasive Rubber) which is excellent material for durability. The rest of the outer sole is good quality, exactly the same as on Asics models costing half as much! This version of the Kayano has seen some changes since the version 21. The most obvious is the foam /gel combination. Its gone and had been replaced by something called FlyteFoam. This new FlyteFoam is claimed to be lighter, more responsive and simply better than all previous foams, gels or combinations ever made. The truth is that none of these claims are obvious to me. What Asics has done in their attempt to keep up with the very successful Brooks DNA is to have abandoned what worked well, looked right and felt good in previous years. They had it and have now lost it! The new Kayanos feel more like the Exalt than anything else. Removing the sock liner reveals a very poor stitching job which I would call blotched. The sock liner is thinner and more like the sock liner from the GT series, not like the distinctive sock liner used on the Kayano 21 which actually had " Kayano 21 " proudly printed on them. The printed overlays look nice, but they sacrificed the necessary toe box height! All gone. The style is no more, gone with the gel. These shoes were not better in any way than previous versions and in some areas not as good. I will not be racing in these shoes. There is something missing other than the toe box. The new Asics Kayano 23 is not an upgrade. Every once in a while a company will make an attempt at making something better. The sad truth is sometimes they become very unsuccessful while trying, sadly leaving behind what worked well for so long, a proud legacy gone. It's actually a lot lighter than the previous models, which is nice because… traditionally speaking it was a heavier shoe. No major game-changers here with the 23s, just the same solid running shoes we've come to expect from the Kayano series. They're great for both short and long distance running. In tests at the RW Shoe Lab, the cushioning proves slightly firmer than in the previous version, but wear-testers still loved the soft feeling upon immediate step-in and all-day comfort. 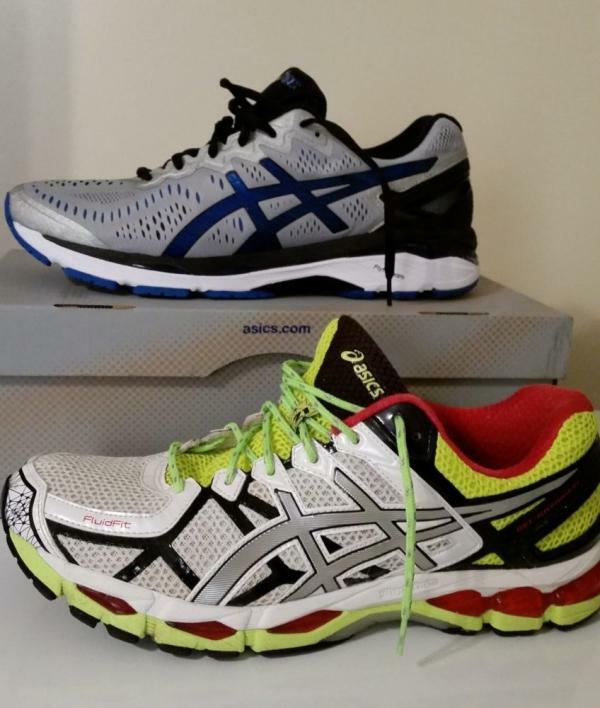 Asics offers considerable updates in the 23rd iteration of the Kayano. The biggest modification in this model is the introduction of the FlyteFoam, which Asics trumpets as amazingly 55% lighter than standard EVA. Besides being more responsive and durable, it greatly helps with the shoe’s weight reduction. The upper also features the New Adaptive System or network of overlays in the midfoot on the medial side to curb overpronation. It works hand in hand with the new engineered mesh to support the foot in the right areas. Because of the new engineered mesh, Asics was able to remove the forefoot overlays without doing away support and security. Another update that should be highlighted is the new external heel counter. Asics made the heel support a bit narrower than before to really hold the foot in place for added stability. The fit of the Kayano 23 is mostly the same as the original model. There is excellent security from the heel to the forefoot. The fit is quite snug that those who are sitting on the edge of their foot sizes may need to go half a size up. It is a new design that should greatly help runners with narrow to medium width dimensions. The outsole of the Kayano 23 is a mainstream Asics design with a heavy dose of AHAR rubber in the heel and other high impact areas, whereas the forefoot is made up mostly of blown rubber. Present in the outsole is a very prominent Guidance Line or a cut that stretches from the heel to the forefoot to help with the transition from landing to take-off. This Guidance Line converges with several forefoot flex grooves for added flexibility. The midsole is where Asics packs most of its technology in the 23rd ride of the Kayano. Most significant in the midsole is the use of the Flytefoam for continuous cushioning responsive cushioning and durability despite being extremely light. Found in the heel going towards the midfoot is a dual-layered foam. It is a bit soft in the heel and gradually becomes denser as it moves near the midfoot to deliver excellent stability to overpronators. Asics’ Gel cushioning system is also located beneath the heel and the forefoot for shock attenuation and added cushioning. It is also used in the Asics Kayano 25 and it delivers the same level of performance as the other Kayano versions.. Finally, a TPU material in beneath the arch enhances stability and torsional rigidity for runners. The new engineered mesh delivers support and flexibility where the runners need it. It continues to be very breathable and holds the foot in place. This seamless construction of engineered mesh and overlays is what Asics calls as the FluidFit System and is designed to cradle the foot in support and comfort. Inside, runners will find the Comfordry X-40 sockliner for its moisture-wicking properties, comfort, and breathability.